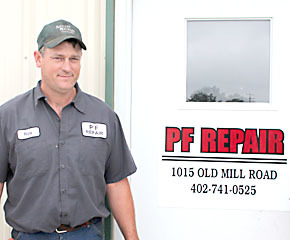 One of Albion’s recently opened businesses is PF Repair, owned by Roy and Judy Pribnow. Roy Pribnow was working for Jim Hageman until he decided to venture on his own. Last June, Roy along with his wife Judy decided to turn the Hageman’s Sales and Service building into their own business. 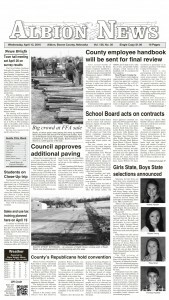 After several months of hard work, the farm equipment repair business was ready to open in November of last year. One worker, Scott Brengelman, is employed there in addition to Roy. PF Repair is located on the south side of Old Mill Road next to the Albion Sports Complex.